Before starting a scanning project it is imperative to estimate how much time and resources your company will need throughout the job. 1. How many pages do you have to scan? One way to tell how much paperwork you have is to count the number of boxes that you would like to be scanned. Double-sided paperwork adds more complexity to the project. 3. How much prep work is involved? How much of the paperwork has staples and paperclips that need to be removed? Do the documents need to be reorganized in order to be scanned properly? 4. How do you want to index the documents? How will you organize the documents in the system once they are scanned? Who will have access to certain documents and who won’t? These are good questions to answer before contacting a scanning professional or estimating the scope. 5. Do you have an DMS to house the documents? Document management systems are a great way to organize and access your documents. Do research to pick the right EDMS for your business. Figuring out the scope of your project is one thing- but when it comes to bulk scanning projects. 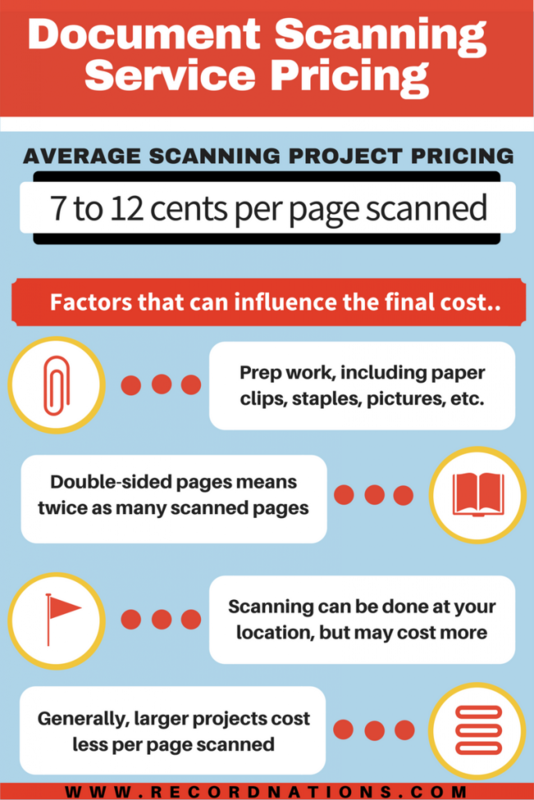 A typical scanning project for an average size business can take just a couple of weeks- but that depends on all the variables that you’re looking at. Watch this video for tips on how to estimate the size of the project and how to optimize you planning to make the process flow as smooth as possible. Scanning and Conversion for Document Management Systems and More! Legal Offices, Practices, and Departments– We can help ensure that the chain of custody isn’t broken- we also offer onsite scanning at the offices of your client, or opposing counsel to speed up the process. Healthcare, Private Practices, Hospitals, and Insurance Companies– Record Nations can help digitize your medical records and even help you migrate them to and electronic health records, or EHR system. Human Resources Offices– From mandatory paperwork required by state or federal regulations to performance reviews and medical information, your personnel files can take up space in your filing cabinets quickly. Construction, Manufacturing, and Real Estate– If you handle multiple projects and a significant amount of paperwork every day, We can help you with any size or any type of scanning for blueprints, drawings, and maps. Government Agencies and Departments– Documents maintained by government entities need to be in strict compliance and require solid security measures to ensure their systems aren’t compromised. Financial Institutions, Financial Planners, and the Financial Industry– Efficiency and productivity are two of the most critical aspects of financial planning and financial management. Educational Sector (Colleges, Schools, Admissions)– Companies in the Educational Sector are looking for more ways to streamline and improve efficiency for and access to admissions, student records, and financial aid processes.